What did we learn from the 2018 survey of nonprofit financial leaders, and what trends should we be paying attention to? 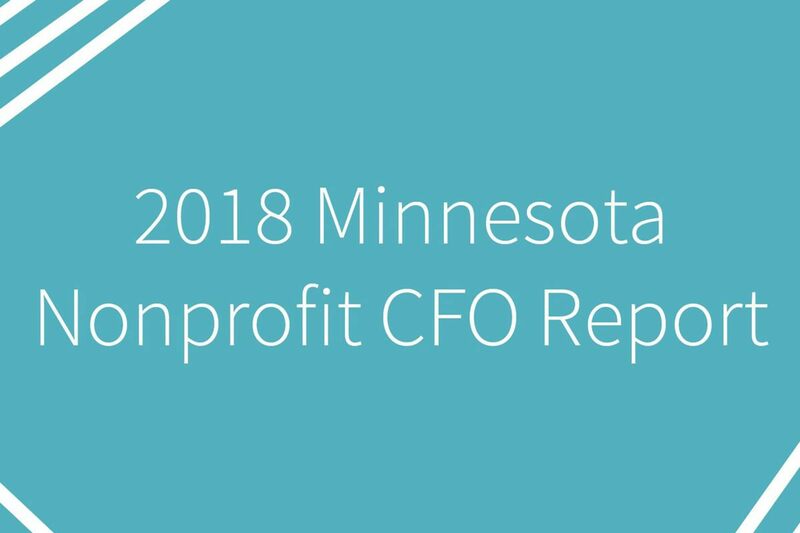 About this time last year, we partnered with the Minnesota Council of Nonprofits (MCN) to survey nonprofit finance leaders across the state, including finance directors, CFOs, and others in the role of financial management. We wanted their perspectives on the current financial condition of their organizations, their financial management practices and policies, and the people working in nonprofit finance. CFOs feel good about 2017, a little less so about 2018. On the whole, nonprofit financial leaders of all budget sizes and service sector felt good about their organization’s financial health in 2017. However, respondents were feeling less confident heading into 2018, with more projecting to break-even or even reflect deficits. Stability of roles. At a time when we’ve been hearing about a lot of changes in the sector, notably at leadership levels, it was encouraging to see financial leaders report stability in their organization. An understanding of finance as key to mission. A large majority of respondents said the financial leader is present at board meetings and that this role is always or usually involved in strategy discussions and decision-making. These both indicate an understanding that finance is part of strategy and is critical to mission effectiveness. Financial leadership can be learned. We’ve long believed that financial leaders can come from any background. The survey responses proved this to be true; a full 20% of those responding said they “happened to be at the organization and were assigned financial duties.” While the majority did have an accounting, finance, or business degree, we also saw backgrounds in biology, sociology, English, and political science, to name a few. The sector is getting more sophisticated. It was particularly affirming to review the responses to two questions that were a bit of a trend indicator, since both had been asked in the 1994 and 2000 nonprofit sector surveys. 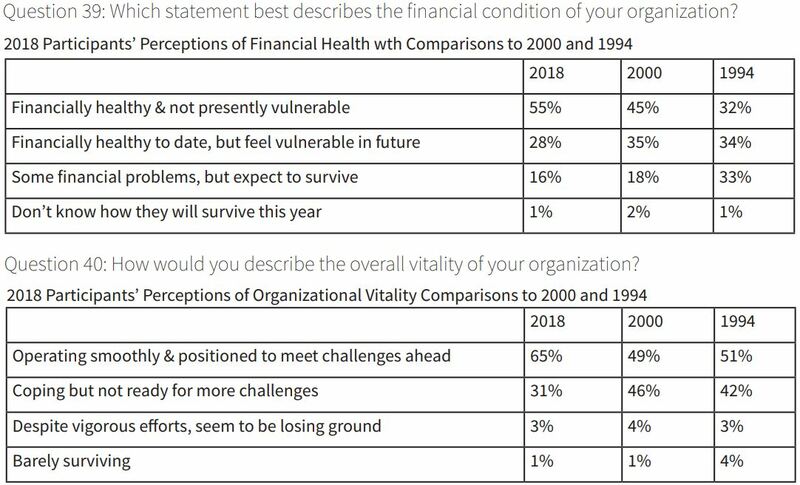 They asked respondents to select a) a statement best describing the financial condition and b) the overall vitality of their nonprofits. We saw a continued increase in financial leaders who say their organization is financially healthy and not presently vulnerable. Likewise, a majority of financial leaders feel their nonprofits are operating smoothly and are well positioned to meet challenges ahead, up from previous surveys. These trends show the sector is steadily gaining financial sophistication, management, and leadership. Unrealistic expectations of board members’ financial knowledge. It was great to see a that majority of respondents regularly present financial information to the board. However, over a third indicated there is an “expectation that board members are knowledgeable coming into the organization” when asked how the board is educated on interpreting and understanding the nonprofit’s financial information. We know this is rarely the case; whether a board member is a community member or banker, we cannot expect them to know our unique financial picture without some board development and training. It’s still hard to build a cash reserve, especially if you rely on government funding. Over a quarter of nonprofits reported more than 6 months cash on hand and over half had a reserve fund. However, that number is far lower for organizations that count on government contracts for more than 50% of their revenue. This makes sense given the reimbursement nature of the government-funded nonprofit model but becomes troubling in the case of a multi-week government shutdown, for example, since the major benefit of that model is reliability. Overall, this survey provides valuable information and insights about the current conditions, practices, and people in the sector. We’re grateful to MCN for all their work in pulling this together, as well as to those who took the time to share information. We deeply value financial leadership, including an openness to share insights for the benefit of the sector. This information helps us be responsive to sector needs and ultimately, makes all of us better financial leaders. Be sure to check out the full CFO survey report here. Also note: nearly 40% of respondents said they attend the Finance and Sustainability Conference to stay up-to-date – mark your calendar for April 11.